SyncBreeze Server provides the ability to schedule periodic file synchronization operations. In order to configure a file synchronization command to be executed periodically, open the file synchronization command dialog, select the 'Advanced' tab, enable the 'Periodic Sync' option and specify an appropriate time interval. 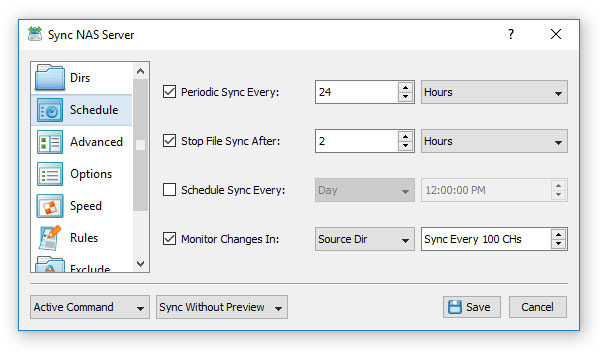 Another option is to configure a file synchronization command to be executed at a specific time of the day. In addition to periodic file synchronization operations, SyncBreeze Server provides the ability to monitor the source and/or destination directories and automatically trigger a file synchronization operation when a user-specified number of changes is detected. 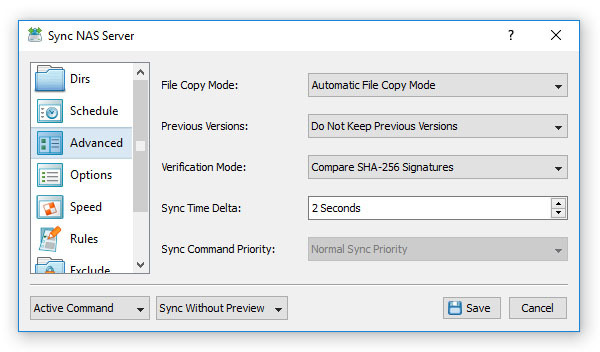 In order to enable the real-time disk change monitor for a file synchronization command, open the file synchronization command dialog, select the 'Advanced' tab, enable the 'Monitor Changes' option and specify the number of changes that should trigger the file sync command. SyncBreeze Server provides a rich set of advanced file synchronization options such as file security attributes synchronization, bit-level file synchronization, file copy verification, etc. In order to configure advanced file synchronization options, open the file synchronization command dialog and select the 'Options' tab.